I grew up in a region where nobody ate beets. A few upstarts ate the canned version, but I was well into my adulthood before I tasted garden-fresh beets (called beetroots in much of Europe). What a revelation! Both beet greens and beet roots are delicious, and growing beets is easy if you use a few tricks. A truly ancient food crop, gardeners have been growing and harvesting beets for four thousand years. Garden beets are enjoying a surge in popularity because of their beauty, nutrition, and complex flavors. 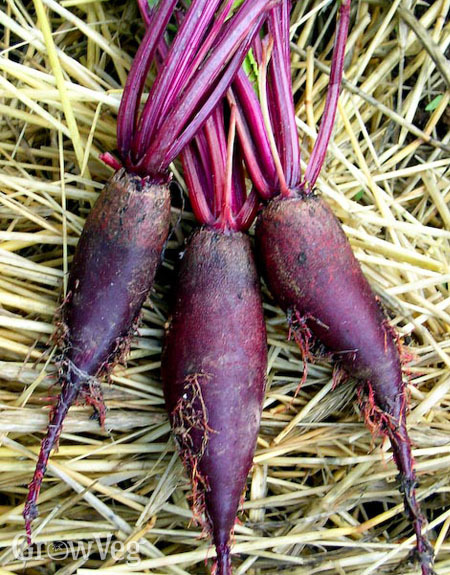 Very dark red beet roots have a deep, rich, spicy flavor compared to yellow beets, which taste so mild they could almost be considered a different vegetable. Varieties can be had with lovely ring patterns, but let your choice of varieties be guided by your taste buds and your eyes. I like red beets for canning, but I plant a mix of varieties to bring a diversity of flavors and colors to the table. 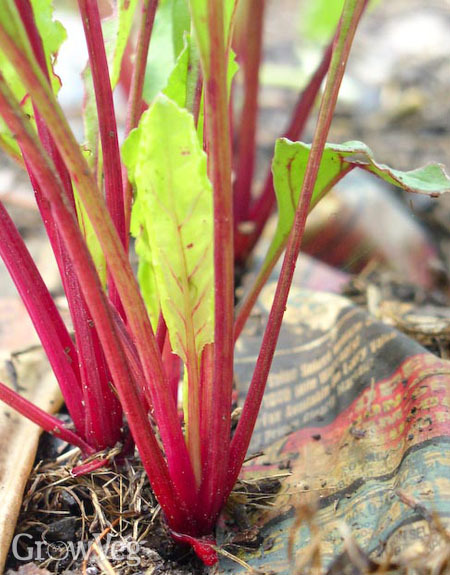 A cool-season crop that grows best in spring and fall, beet roots mature in 60 days or so, and mature beets will usually hold in the garden for a couple of weeks. Beets grow best in rich, fertile soil with a near-neutral pH between 6.2 and 7.5. Beet seeds are spiky nutlets that enclose pairs of tiny lentil-like seeds. Germination is often rapid yet spotty following warm spring rains; the easiest way to fill in skips in rows is to plant more seeds. It’s never too soon to start thinning and weeding beets, which I do with my fingers and the tip of an old steak knife. If both of the seeds in a nutlet germinate, one of the twins must be pulled out or snipped out with a small pair of scissors. When faced with numerous seedlings that must be thinned, I’ve had good luck lifting and transplanting very young beet seedlings, but seedlings moved when they have more than three leaves never recover from the trauma. Maintaining steady soil moisture and controlling weeds are the two biggest challenges in growing beets. Beets that are allowed to run dry tend to develop high levels of geosmin in their tissues, which is the chemical compound that gives beets their earthy flavor and aroma. A little geosmin is good, but too much and your beets will start tasting like dirt. Please note: geosmin is most concentrated in the skins of beet roots, which should always be removed as they are prepared for the table. After my beets are properly thinned and weeded, I often use a newspaper mulch to block out weeds. Thin layers of grass clippings are even better. You can start harvesting beet greens for salads or cooking anytime, but removing leaves may reduce how much energy the plants can apportion to plump roots. Beet roots push up out of the soil as they expand, taking the guesswork out of beet harvesting time. Lightly wash beet roots after you pull them, and cut the leaves back to 2 inches before storing beets in the refrigerator. Leaving the leaves intact takes moisture from the harvested beet roots, but you can steam and freeze the young, tender beet greens taken from the centers of the crowns. In recipes, cooked chopped beet greens are interchangeable with closely related spinach or chard. Clean beet roots will keep in the fridge or root cellar for a couple of months. As spring turns to summer, you can allow beets to stay in the ground as long as they are not stressed by dry conditions or searing sun. In hot summer areas, many gardeners erect shade covers over growing beets to preserve their quality during heat spells, thus stretching beet harvesting season by a couple of weeks. I grow a second crop of beets in the fall. In my experience, beets grown when days are getting shorter and cooler tend to be small but quite sweet. Plants left behind often survive winter in my garden, and overwintered plants produce a fast flush of beet greens before developing flowering stems from multiple crowns. Beets are true biennials, so they must endure a period of chilling before they develop flowers and seeds. The wait for ripe seeds can last 6 weeks from bolting, but it’s time well spent if you want to grow a seed crop from an open pollinated variety. "Beets have been a problem for me. I love them, but for some reason, they either never attain a large size or flop over as seedlings. Should they be protected by row cover? Do they need full sun? My turnips and carrots do fine, but the beets have trouble." "What SPECIFIC amendments do beets prefer? Phosphorus,Potassium, Magnesium Dol.Lime, Ground Corn etc.? Of course everything loves compost, compost Tea and fish fertilizer. What about disease and insects?" "Oh, what about companion plants (and how specifically close to the good and bad guys?) and lastly, rotation?" "April, beets do need full sun, and I hope you keep trying because the success of your carrots is a good sign. I've used row cover to hide beets from deer, and the beets never complained. TJ, beets have few insect pests and they come and go quickly, and are best rotated in a block with spinach and chard. I often interplant with kohlrabi or onions because they grow at the same time. The only specific soil amendment that may not be adequately supplied by compost is boron, but it's needed in very small amounts and few gardeners will need to add it. Beets are generalists I suppose, in that fertile soil produces the best beets. " "I love beets, but like April, I have trouble growing them. I suspect it because the pH of my soil is too low. It probably gets below 6.0 at times." "i have sowed from seed but not sure how big they need to be before i plant outside. please help, steve"
"Steve, transplant those babies right away, when they don't have their first true leaf yet if you can. Good luck!" "In the past two weeks my beets, which had been doing great, have gone from having thick bunches of bright green healthy leaves to a situation where the leaves seem to be riddled with some kind of leaf miner. Over the course of a week nearly half of the leaves have developed papery thin dry patches. There is no visible pests on the leaves but something is really running amock ... suggestions?" "Both spinach leaf miners and beet leaf miners can damage beets. The miners are fly larvae that feed inside the leaf, so insecticides can't help. Removing infested leaves can stop a second generation, and some people trap the adult flies with blue sticky traps. Leaf miners are usually a sporadic rather than a chronic problem, and your beet crop should be fine as long as the damage is not too severe." "beet juice drank daily will extend your life span to over 900 years"
"can you seed in fall over winter seeds in ground ready for spring"
"Unless you live in a mild winter climate, it is best to plant beet seeds in spring. Seed sown in fall may be eaten by critters or rot, and any that sprout and survive the cold would promptly bolt in spring. " "I planted my beets late mid summer. I have been picking and eating them every so often. They are very tiny and sweet. I became very busy and there are a few still in garden. It snow January should i pick them first thing in the morning or will theybe ok through these snowy months. April H. "
"Hard freezes do beets no good and may kill them, so I would go ahead and harvest the little beets you have, and store them in the refrigerator. " "Hi, the information on the web is very confusing about whether transplanting beets is advisable or not. I've just transplanted a stack of beet seedlings but they've all already got two or more true leaves. Now I see you don't recommend transplanting at all. Should I dig them in and start again?" "Hi Donna, It is not advisable to transplant beets, but they can't read so they don't know it. Beets grow just as well if not better from direct sowing, but if the transplants receive good care and keep their taproots intact, they can make a nice crop. Good luck!"